Expert Research Blog of the Year? Whoa! ResearchBlogging.org just listed the finalists for their 2010 blogging awards. Brain Windows is one of five finalists for Expert-Level research blog of the year. Cynics might say that giving out small monetary awards ($50, oh yeah baby!) and allowing voting only by bloggers registered by researchblogging.org is a cost-effective way to promote their site. This is hardly the only promotional tactic out there though. About once a week, I get an email from some firm that wants link share or have a service giveaway to influence content on Brain Windows to drive traffic to their site. I’ve never posted those things because the message never serves the readership of Brain Windows. However, Researchblogging.org does serve a useful purpose beyond just a content aggregator. Posts within that network, as well as Postgenomic, Nature Blogs, and Bloglines feed into the new PLoS One article-level metrics which give an idea about the impact of a publication long before additional journal publications have a chance to cite it. These metrics are another welcome step towards the validation of alternative, democratic models of content distribution in science. So, if you are a believer in science blogs, alternative metrics of research output, and want to help me with my beer fund, head over to researchblogging.org, register and vote for Brain Windows. Voting invitations are sent out to registered users on March 4th. Philosophy : Can a Biologist Reverse-Engineer a Radio? Every week or two one of the post-doc’s in our lab passes around a paper that is as much philosophy of science as experimental result. One that recently made the rounds is Can a Biologist Fix a Radio?, by Yuri Lazebnik, a spirited and humorous dissection of the flaws of the standard methods of experimentation and analysis in cell and systems biology. The primary contention is that most biologists are not sufficiently quantitative in their descriptions of the interactions of components in their system, which leads to an abundance of confusing, conflicting experimental results. If we hope to understand complex biological systems, we must describe the components in sufficient detail, with a standardized language, to allow accurate models built from numerous components. A radio can be perfectly described by its circuit diagram due to the quantitative knowledge of the component properties. Using a simplistic biological pathway diagram provides little insight. Two schematics of a radio. The biologist's view (top), and the engineer's view (bottom). Recently, a similar paper, On the Precarious Path of Reverse Neuro-Engineering, in Frontiers in Computations Neuroscience, highlighted a logical flaw in how much neuroscience research is done. When we find patterns or correlations between an external signal to neuronal activity, the tendency is to proclaim “Aha! This is how the circuit represents information and what it uses to make decisions.” But correlation does not equal causation. In this paper the authors build a physical Braitenberg Vehicle II, which is a component of a classic thought experiment in neuroscience. It navigates an environment by acquiring optical input, processing it through a network of cultured neurons, and then controlling a motor output through a simple rule about the firing of the neurons. Recording the activity of the neurons leads to the discovery of a ‘population rate code’ in the activity of the neurons, which describes the behavior of the robot fairly accurately. An experimental biologist would be tempted to call this finding the ‘neural code’ of the system. But, the navigation rule that robot actually follows is not based spike rates at all, but rather the order of first spikes in a handful of the neurons in the network. The correlation between population rate activity and behavior is real, but it is not what is relevant to the circuit and the behavior. This example cuts deep, and hits my unease with much current brain circuit analysis. There are huge numbers of papers that show particular stimulus features can be extracted from the firing patterns of neurons in a particular brain region, but rarely does a study conclusively demonstrate that the circuit actually uses these correlations in the computational task. Demonstrating causality is difficult, but essential if we are to gain an understanding of how brain circuits really work. Despite the presence of many spikes (blue) and a population spike rate, the robot only cares about the delay to time of the first spike (black circle) in a subset of neurons. Over the weekend I had the opportunity to deliver a Message to a Unitarian Universalist congregation in my hometown. The topic? 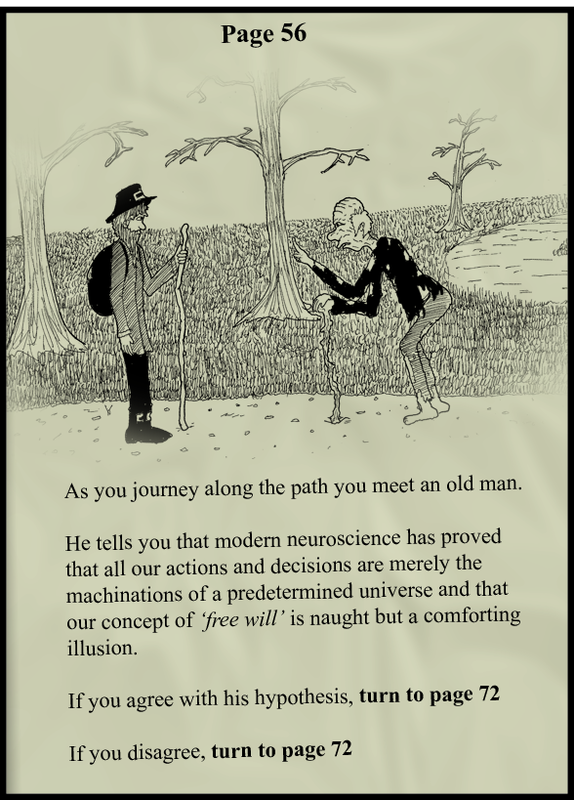 The Science of Free Will : What science does and does not tell us about our ability to choose. It was quite a challenge translating some recent scientific results into layperson terms, while tying the results to more philosophical issues. I think the sermon went well though. The churchgoers are almost dogmatically anti-dogma and openminded, with many questions that were dificult to answer. It was a great experience to get outside the bubble of science. Below are my prepared remarks, led off by two readings from Hippocrates and David Foster Wallace. An audio link will be up in a few days. The full version of the David Foster Wallace reading is available here, and is well worth the 10 minute reading time.